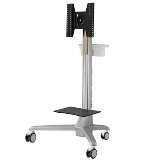 High quality cart/trolley for medical - HIGHGRADE TECH. CO.,LTD. As a leading manufacturer of Cart in Taiwan, we provide Mobile Cart with superior quality. In addition, innovative design, durability, high performance, and low maintenance requirement are the features of our Mobile Cart, Articulating Wall Mount, LCD TV Wall Mount Bracket. As a quality centric organization, we follow internationals quality standards throughout our business process. If you have any questions, want to buy in bulk, or have us give you a quote for Medical Cart, Media Cart, Cart Accessories or Mobile Cart to fit your needs, please email to us.